Though, it's a short biography of third caliph Rashid, one of Ashre-Mubashsherah, Hadhrat Uthman al Ghani (R.A.) well 'known as Zun-Nurien. However, the aim of this praise worthy compilation, by describing the real situation and authenticated facts during his caliphate; is to discuss and prove the baseless allegation and false propaganda of conspirators levelled against him. Thus this book, no doubt, is a successful effort for which it is written. This book which is the third part of the Series, is a biography of Hadhrat "Uthman bin' Affan (Allah be pleased with him) and his remarkable achievements in the history of lslam. Every attempt has been made to narrate only authenticated facts in a clear, concise and lucid style. May this book serve the purpose for which, it has been written. The period preceding the advent of Islam was the dark age of ignorance during which the Arabs had been accustomed to idolatry, gambling and drinking. They were quite ignorant of the rudiments of social virtues. The country was rent into innumerable petty states which were always at war with one another. Trifling disputes between individuals would lead to a terrible conflagration and blood feuds extended from generation to generation. When the country was steeped into utter darkness, the light of Islam dawned and it illuminated the whole world. The Prophet Muhammad (peace and blessings of Allah be upon him) appeared as a warner and harbinger of glad tiding. He summoned the depraved community to the right path in the teeth of bitter opposition. While his distinguished Companions stood by him through thick and thin. They shared his sufferings and stood firm like a rock buffeting the waves of hostility with such a strong conviction as had no parallel in the annals of history. After a great deal of endeavour by the Holy Prophet (peace and blessings of Allah be upon him) with his illustrious Companions like HadratAbu Bakr, 'Umar, 'Uthman and 'Ali (may Allah be pleased with them) many social evils were swept out. The hostile tribes were united in faith and obedience. They were all joined into brotherhood cemented with amity and concord. Their fighting spirit was tamed and their quarrels were appeased and forgotton. The wild untutored sons of the desert, spoilt children of the obscure land, veilded in mystery and darkness, were pulled out into light, brilliance and dazzling. The Holy Prophet (peace and blessings of Allah be upon him) was just like the moon, whereas Hadrat Abu Bakr, 'Umar, 'Uthman and' Ali (may Allah be pleased with them) bore resemblance to the beams of the moon. They were all of equal status. They had sound friendly relations with one another. It is undesirable to make any distinction in them. Whosoever finds fault with anyone of them may invoke the wrath of Allah. He should feel penitent of this act of impudence. 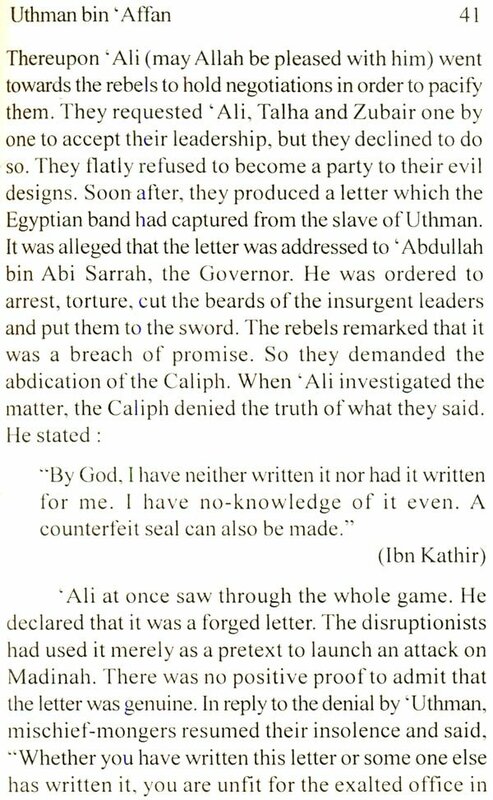 Some of the historians have tried to deface the fair image of Had rat 'Uthman, in spite of the fact that he occupies a prominent position among the Companions due to his attachment to his Master (peace and blessings of Allah be upon him) and the glorious services rendered by him to the cause of Islam. His noble soul faced martyrdom, but he avoided becoming the root cause of dissensions in the Muslim Community. He refrained from using force till the last moments of his life. The main purpose of writing this book is to acquaint the readers with the real situation. The allegations levelled against Hadrat 'Uthman were absolutely baseless. His character was perfectly free of the blemish imputed to him out of malice just for the sake of false propaganda. I am deeply indebted to the veteran scholar Prof. 'Abdul Hameed Siddiqi who has been kind enough to revise the manuscript of this book and make valuable suggestions. I am also grateful to Mr. M. A. Qazi of the Kazi Publications who has undertaken to publish this book with the fervour of a religious devotee. My younger brothers Messers Muhammad Iqbal Shaikh and Muhammad Ikram and my friend Karamat 'Ali also deserve my special thanks for their help and assistance.